Southern-style okra fried with a coating of cornmeal and flour. 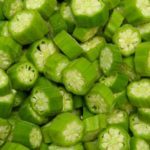 Slice okra into 1/4 to 1/2-inch slices. Place okra in a bowl. Add the cornmeal and flour and stir until okra is evenly coated. In a skillet over medium heat, add the oil to cover the bottom of the skillet. Once the oil is heated, add the okra to the skillet and cook for a few minutes until lightly browned on the bottom. Use a spatula to turn okra over in the pan. Add more oil if needed (okra will tend to soak up the oil). Continue to cook and turn okra until evenly browned. Transfer okra to a bowl or platter lined with paper towels. Season with salt and pepper. Remove paper towels and serve okra warm.